【2017】Introducing some of Himeji’s cake shops. Which Christmas cake would you like to have? When I think of the end of the year, I image it as a busy time but biggest event is definitely Christmas! Cake shops have already started taking orders for Christmas cakes. Every year, It’s hard to decide which one to go for, but this year the Himeji Mitai editorial department try to make it easier by introducing some delicious cakes. We asked five stores about their three most popular cakes! ◆Sachertorte cake is finished with an aromatic cocoa’s sponge with rich chocolate and fresh Hokkaido ganache cream.Because the cake is for children too, the alcohol is discreet and complements the flavor of the chocolate. ◆Next is a gorgeous strawberry tart. The crispy almond base has good texture, and the modestly sweet custard cream use plenty of eggs and strawberries. ◆Next up is green tea Noel cake. With its bright green color, this one feel very Japanese.The sponge cake is made with green tea butter cream and crushed chestnut and topped with green tea ganache cream. And the cake is modestly sweet and people of all ages can taste it. There are also tables where you can sit down and enjoy a leisurely a cup of tea and a piece of cake. 117-1, 2- Chome, Tenjin-Cho, Ohtsu ward, Himeji city, Hyogo Pref. Please order at the shop or make a phone call from mid-November until 19th December. Although there is a sale on Christmas day, go as early as possible to avoid disappointment. ◆The ganache cake is made using a moist and fluffy cocoa sponge, using eggs from Yumesaki town in Himeji. The outside of the cake is coated with rich chocolate. This cake is best for chocoholic people. ◆Noel cake is a chocolate cream sandwich with sweet and sour raspberry mousse between luxurious coffee chocolate sponge. ◆Fresh cream decorated cake. The fluffy sponge cake decorated with fresh cream and strawberries and is a popular cake you can enjoy with the whole family. The store is decorated with cute balloons and has welcoming atmosphere that makes you feel free to come in anytime! The shop also sells balloons. 6-17-30, Tsujii, Himeji city, Hyogo pref. Wednesdays (If the Wednesday is a public holiday, the shop is open and closed the next day.) ※There is a holiday other than Wednesday once a month. Please check the home page for detail. Please order at the shop or make a phone call before 19th December. You can specify the date you want to receive the cake at the store. Prepayment system · Cancellation after December 20th is not accepted. Due to high demand, there are almost no cakes on Christmas day. Please make your pre order as soon as possible. ◆The fresh cream decorated cake uses a fine textured sponge cake and an original blend rich flavor cream. The refreshing strawberries further enhance the cake. ◆The premium fresh cream decorated cake gives 120% satisfaction! There are more strawberries on this two-tiered cream and strawberries sandwich cake. Everything about this cake is special. ◆Maraguda is a Christmas version of the regular chocolate cake sold at L'AIGRETTE. It is a popular rich chocolate cake which melts in the mouth. You can also purchase cakes are made using rice flour instead of wheat flour, and watching to the owner it is clear that he is dedicated to cake making. 3-1-17, Honmachi, Shinzaike, Himeji city, Hyogo pref. Wednesdays but open on 20th Dec.
5% OFF if you pre order at the following website. Due to high demand, there are almost no cakes on Christmas day. Please make your pre order as soon as possible. ◆The BIRTHDAY cheesecake contains three types of cheese and has two layers of soufflé and rare cheesecake.This is a Christmas version of the shop’s long time popular cheesecake. ◆The pure cream cake uses plenty of pure cream from Hokkaido and has moist sponge cake. 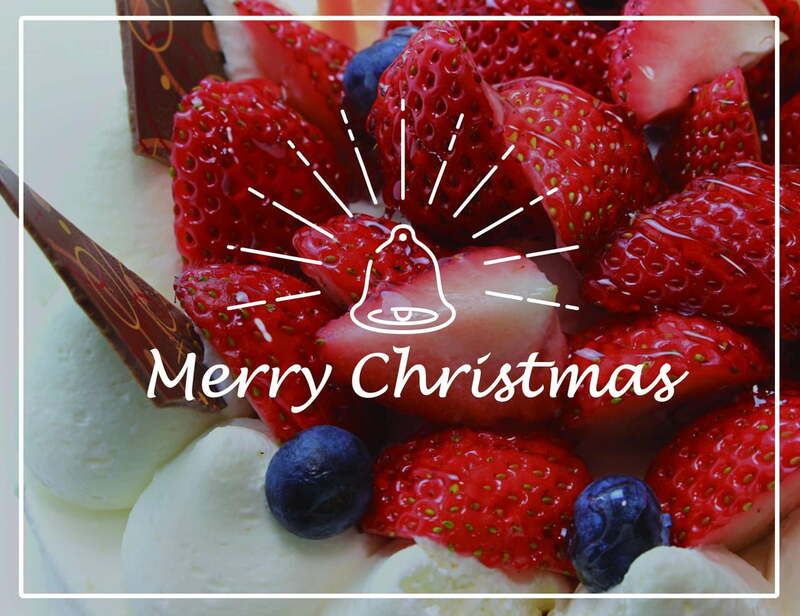 It is a Christmas classic cake made with strawberries from Kumamoto and has a cute Santa ornament. ◆Ishigaki is the most popular cake at this shop! Belgian chocolate is used for the 12-layer chocolate cake, and you can enjoy a different flavor and texture in each layer! This shop is famous for the high quality of its cakes and originality! 830-1, Ogawa, Hanada-Cho, Himeji city, Hyogo pref. You can receive a gift of 300 yen when collecting your pre ordered cake. E-mail members can get a further 200 yen discount. ◆The fresh cream decorated cake uses a smooth textured fresh cream from Hokkaido. The sponge is softly baked and includes a lot of ripe strawberries from Kyushu. The cake is rich and refreshing. ◆The Earl Gray chocolate cake uses a mix of a crispy chocolate and nut paste and sponge cake flavored with almonds and raspberry source. This fragrant cake is topped with an Earl Gray tea mousse and milk chocolate. The rich and complex cake is most suitable for adults. ◆The Berry Berry uses plenty of large ripe strawberries and blueberries.The moist sponge cake is made with plenty of eggs and strawberries. This cake rich in healthy vitamins is especially suitable for the winter seasons. The signboard features a cute reindeer and the cakes are reasonably priced. 9-1, 1-chome, Agamiyama-cho, Shikamaku, Himeji city, Hyogo pref.